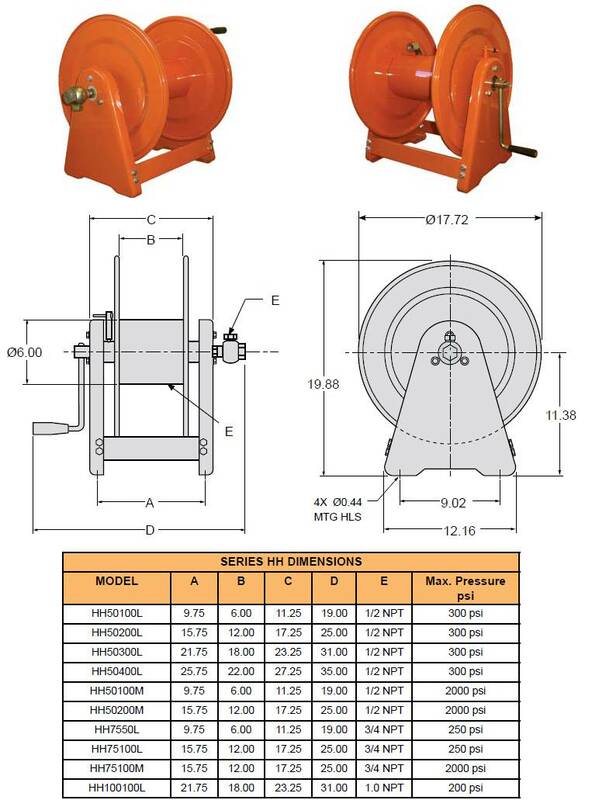 Spring-Operated Quad Hose Reels for Hydraulic Lift Trucks. Gleason's unique four port design improves operator visibility, increases reel efficiency and provides substantial cost savings. 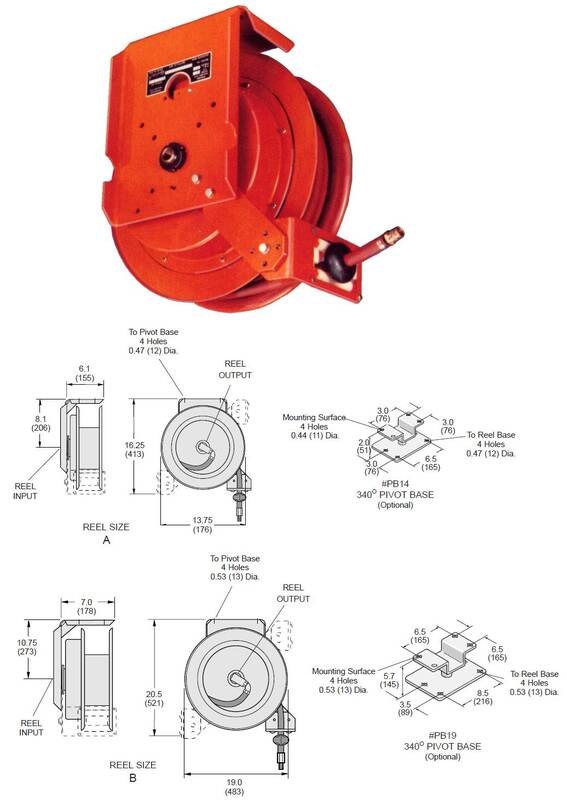 The R45 Series spring operated quad hose reels provide design simplicity and compactness, installation and replacement ease, and dependable, long service life. 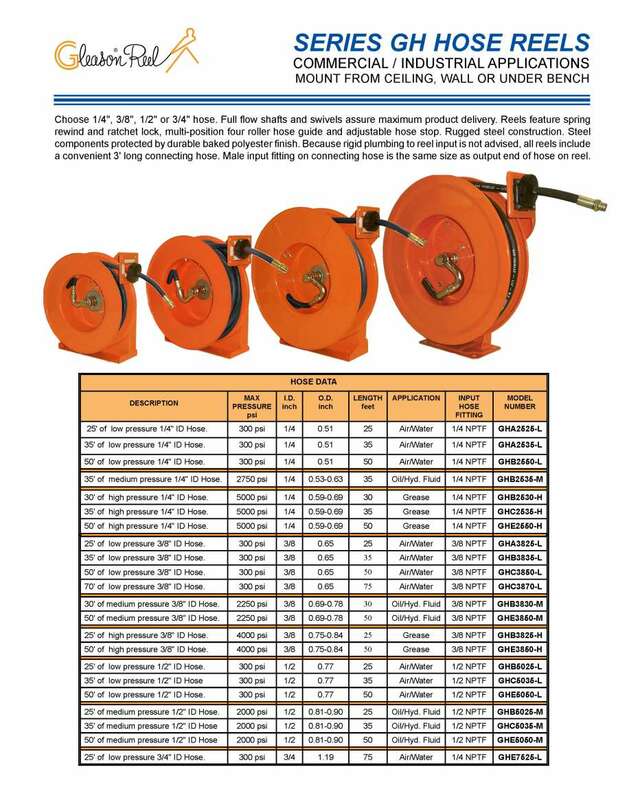 These rugged reels are available with capacities to 17 feet of #4 hose and for pressures up to 2000 PSI. 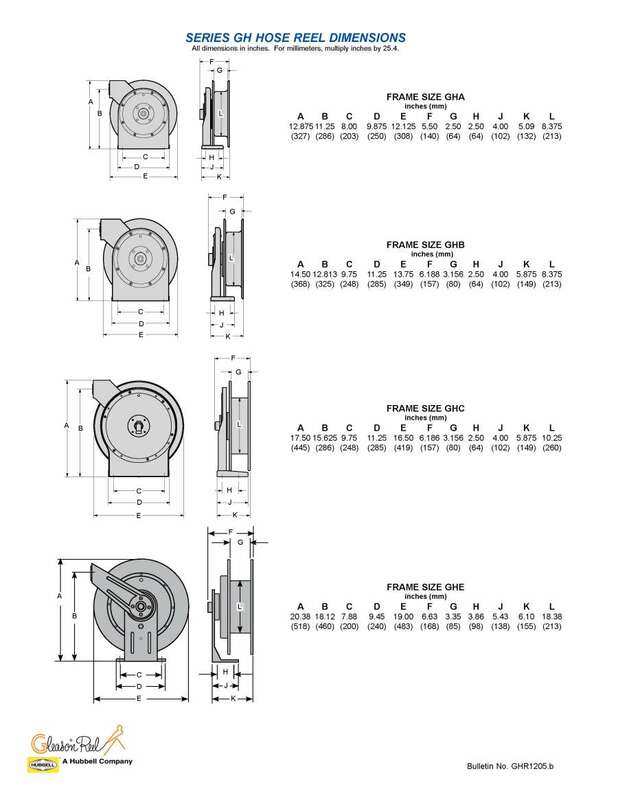 Available in rim rewind, direct or geared crank rewind or with air or electric motor drives. This broad line of hose reels solves a range of applications. Rugged, dependable and trouble free, these reels are designed for general shop use. 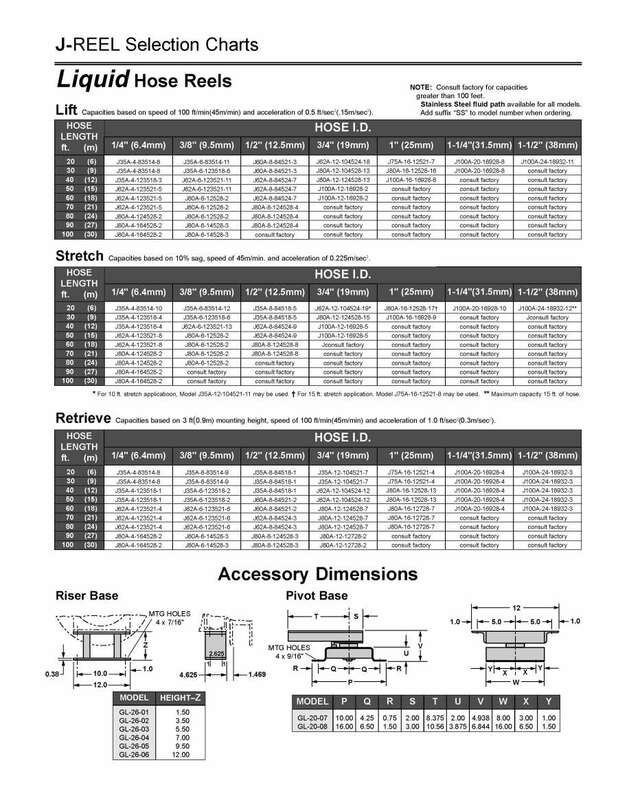 They can be mounted wherever most convenient; on carts, walls, poles, or ceilings. 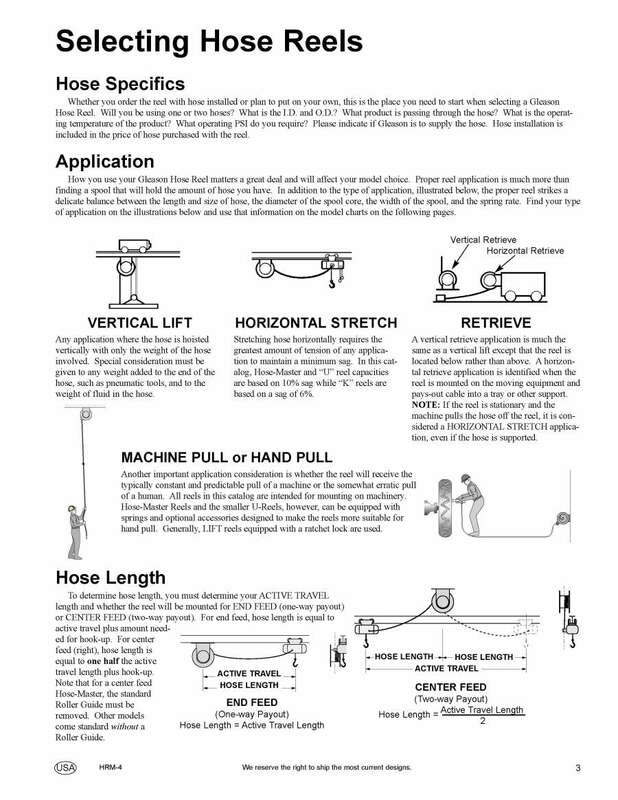 A slight tug on the hoses releases the ratchet and the hoses are automatically retrieved onto the reel where they are out of the way, off the floor, and safe from accidental damage. 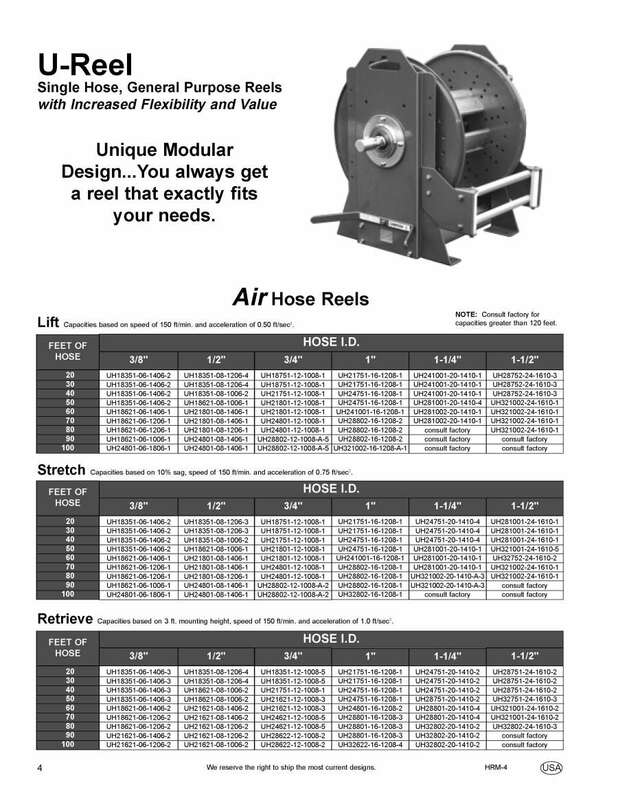 Models available for 60' or 100' long hoses. 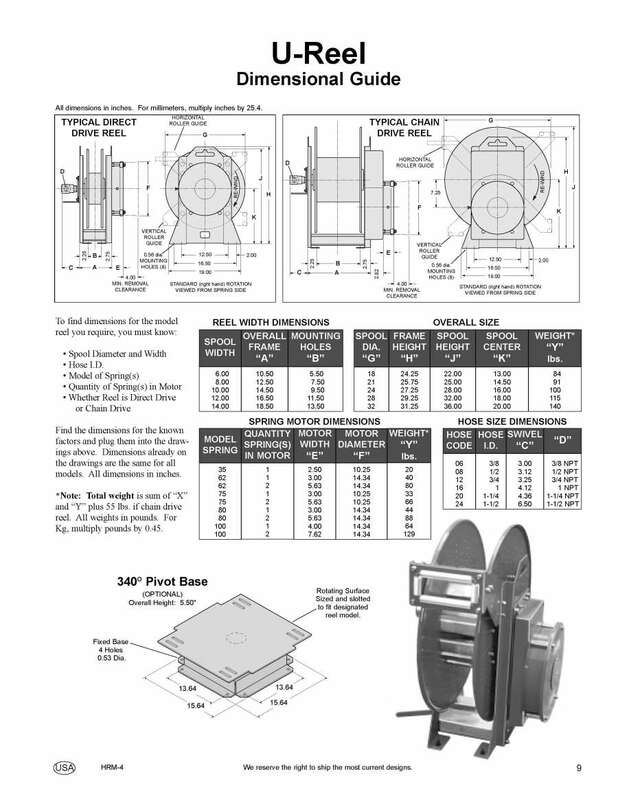 The Gleason Hose-Master is the most rugged single hose, general purpose hose reel of its size in the industry. We created it with the most demanding reeling applications in mind, hand pull or machine mounted. Oversized bearings and a heavy duty, one piece main shaft (also available in stainless steel) give the Hose-Master superior mechanical strength. Roller Guide is standard. The reliable ratchet and dog allows quick and easy changeover from window shade-type action to continuous tension. Handles up to 70 ft. of 3/8" I.D. hose. Maximum hose diameter is 1/2" I.D. 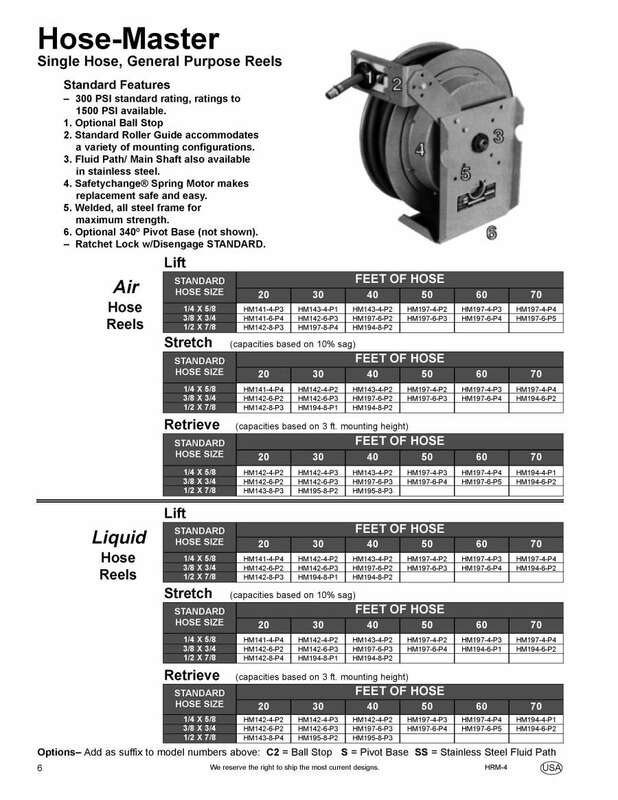 Reel is rated at 300 psi per standard hose and hose fittings. 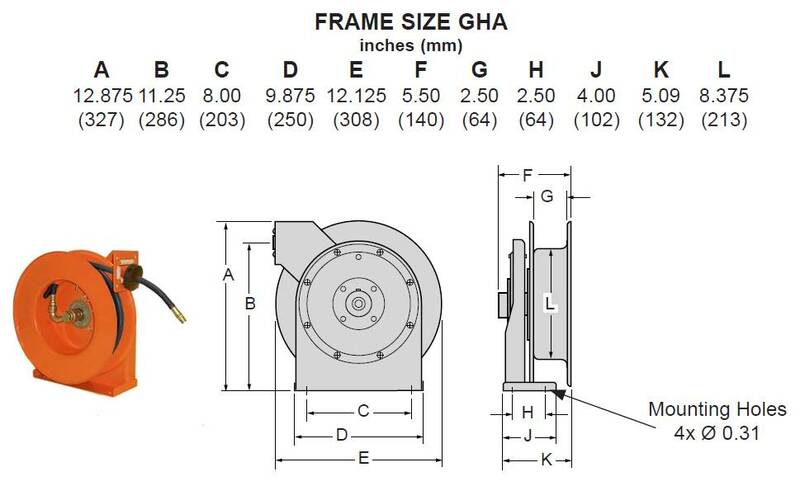 The reel itself is capable of higher pressures with proper hardware. 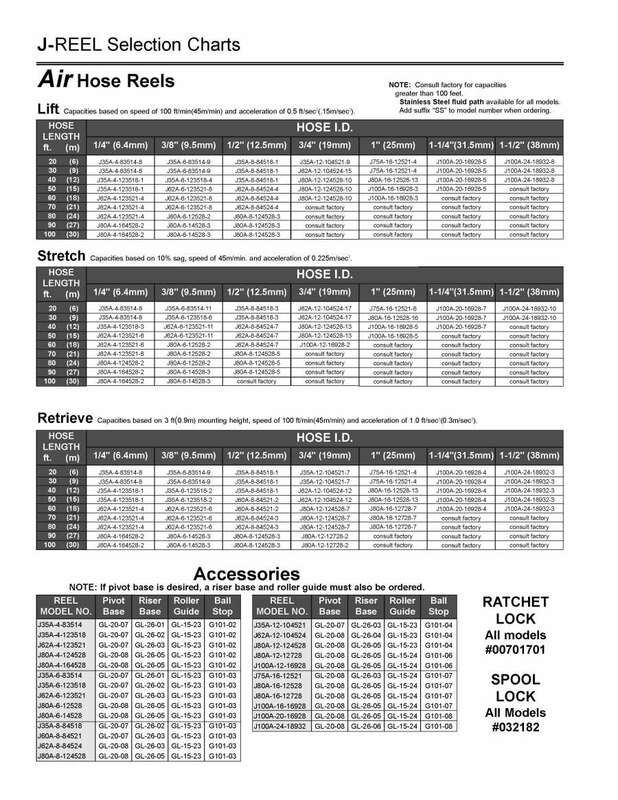 Choose 1/4", 3/8", 1/2" or 3/4" hose. 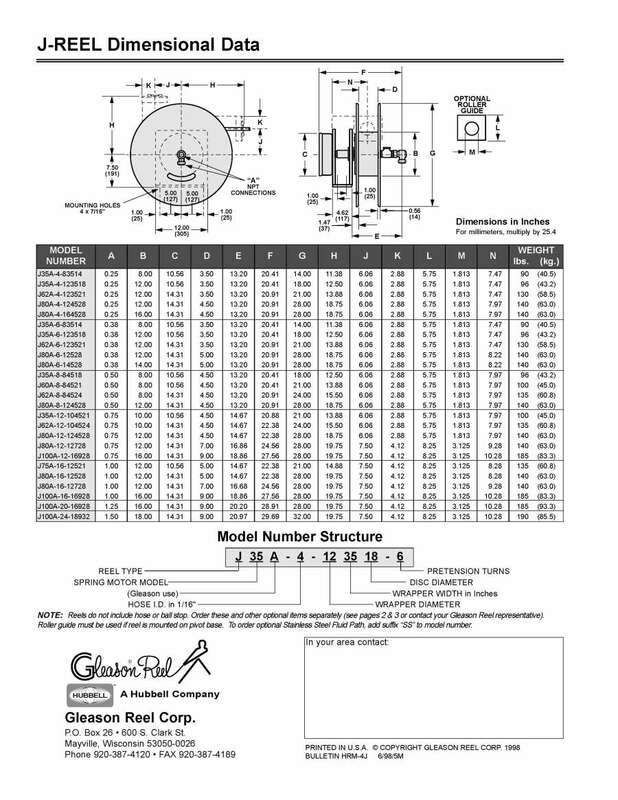 Full flow shafts and swivels assure maximum product delivery. Reels feature spring rewind and ratchet lock, multi-position four roller hose guide and adjustable hose stop. Rugged steel construction. Steel components protected by durable baked polyester finish. 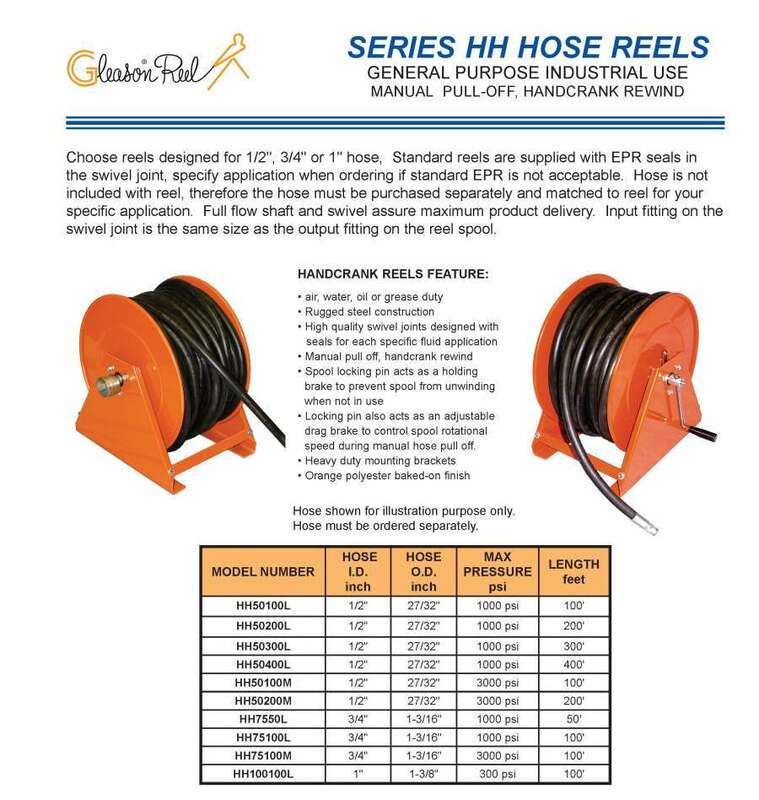 Because rigid plumbing to reel input is not advised, all reels include a convenient 3' long connecting hose. Male input fitting on connecting hose is the same size as output end of hose on reel. Choose 1/4" dual welding hose, or 3/8" and 1/2" single hose in the Series MHA models or 1" and 1-1/2" hose in the Series MHB models. 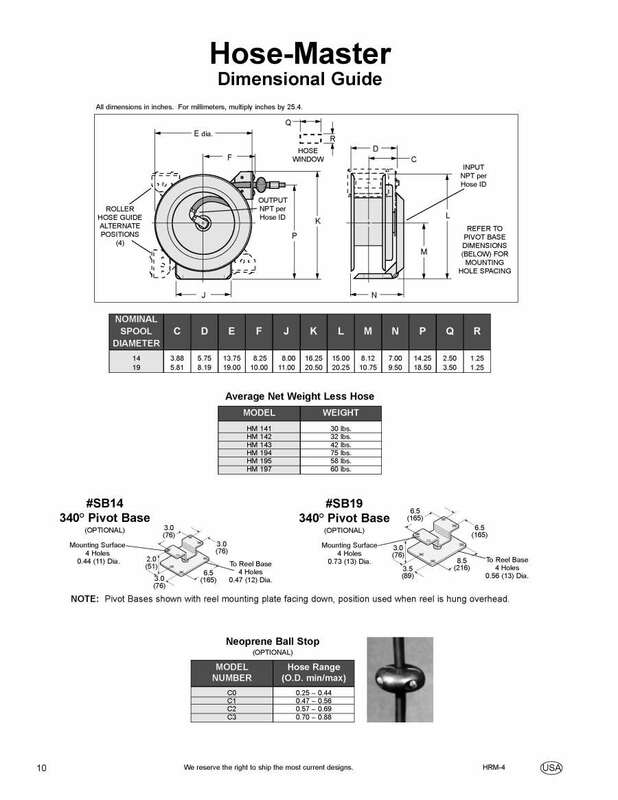 Full flow shaft and swivel assure maximum product delivery. Reels feature spring rewind and ratchet lock, multi-position four roller hose guide and adjustable hose stop. Rugged steel construction. Steel components protected by durable baked polyester finish. 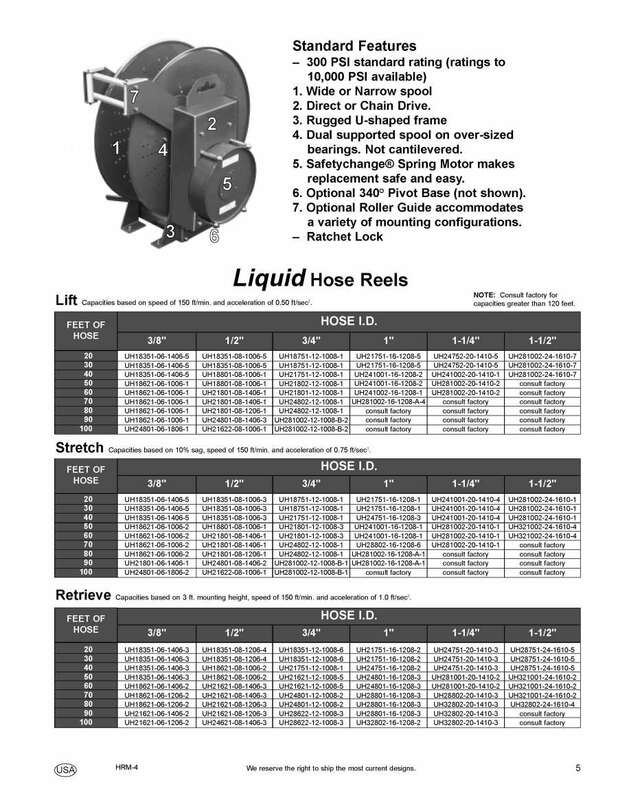 Because rigid plumbing to reel input is not advised, all reels include a convenient 3' long connecting hose. Male input fitting on connecting hose is the same size as output hose on reel spool. Typically applied to the most demanding industrial application. May be used for air or liquid. Easily handles hose up to 2" (51mm) O.D. Normally machine mounted, it may also be used in hand pull applications. 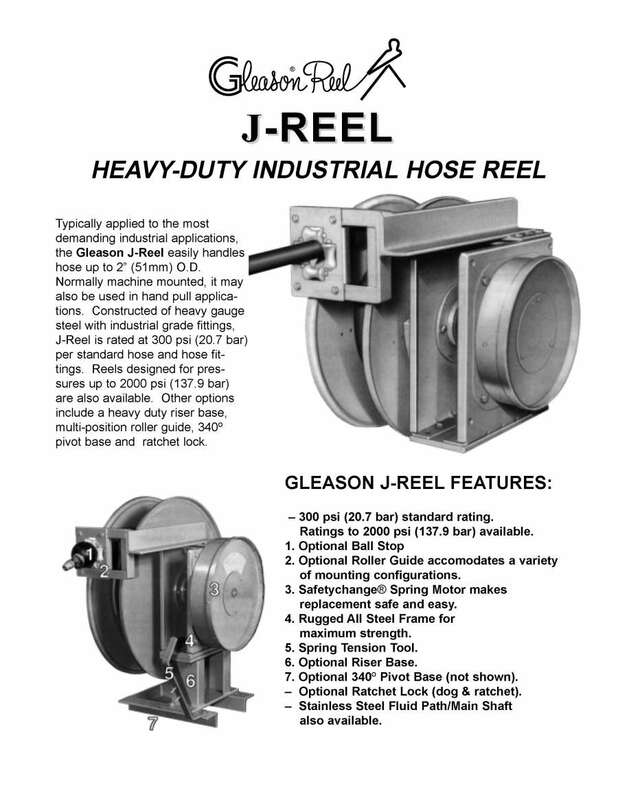 Constructed of heavy gauge steel with industrial grade fittings, J-Reel is rated at 300 psi (20.7 bar) per standard hose and hose fittings. 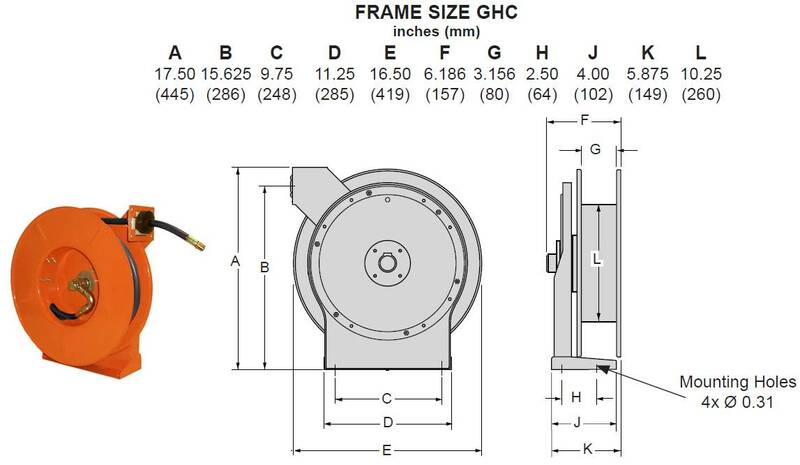 Reels designed for pressures up to 2000 psi (137.9 bar) are also available. 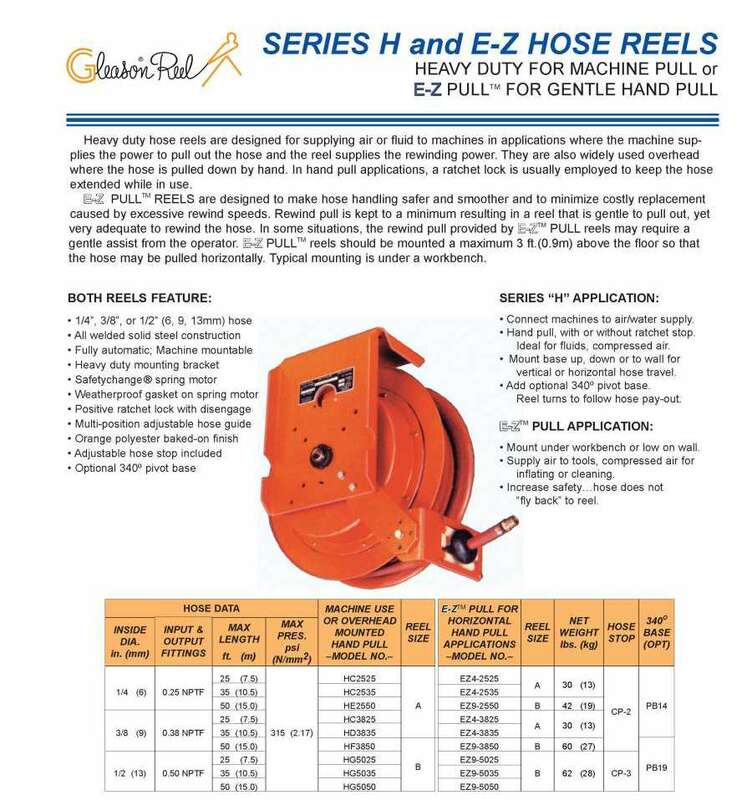 Gleason K-Reels are ideal for hydraulic hose control on boom cranes, hoists, tree cutters, lifts or any moving hydraulic equipment. They can also be used for other liquids or air. 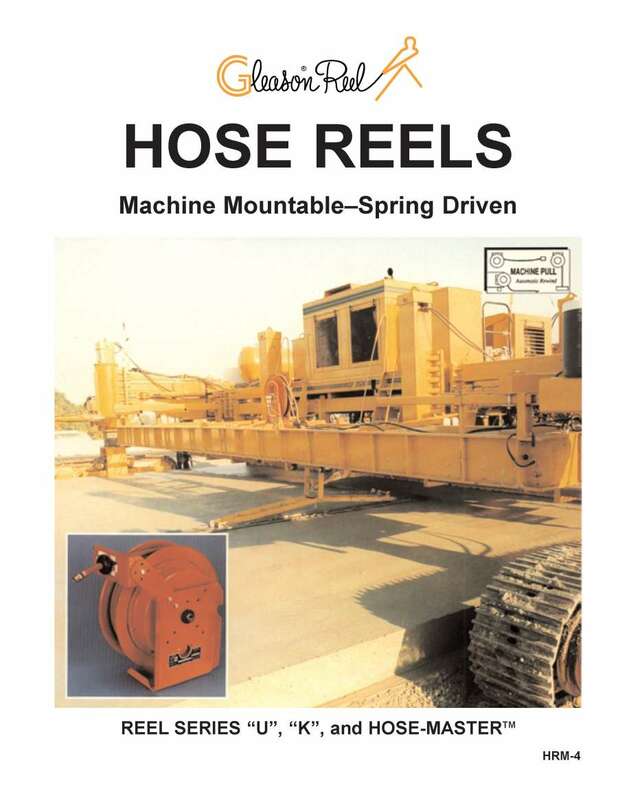 Whether machines push-pull, extend-retract, turn, tip, clamp hold or dump, Gleason series K all-steel spring driven dual hose reels speed operation and improve handling and safety. 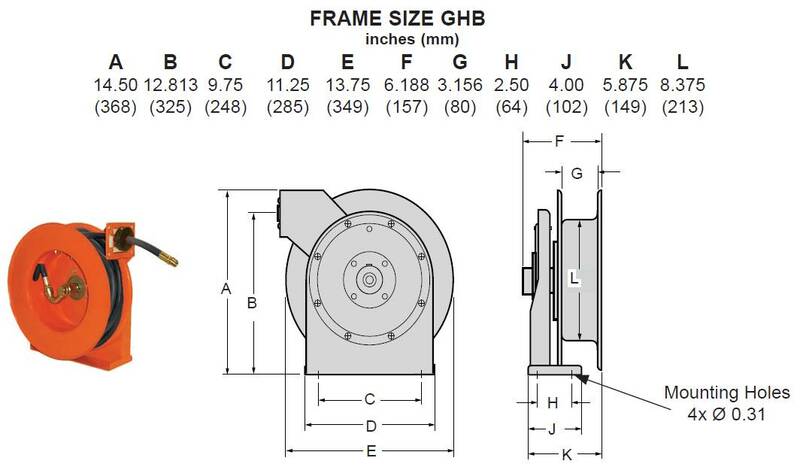 K-Reels handle up to 80 ft. of 1/4" I.D. dual hose with 3000 psi full-flow pressure throughout the reel. Maximum 3/4" I.D. hose. 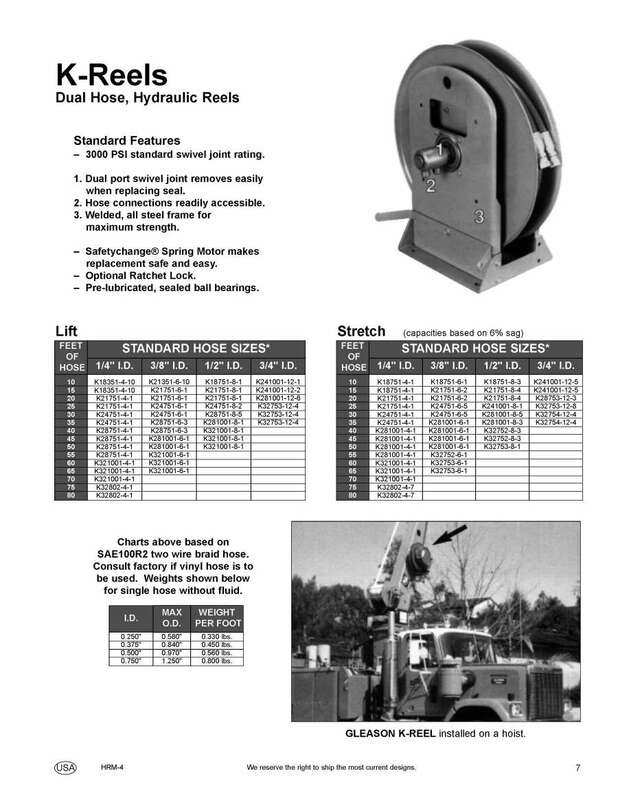 Spring Operated Dual Hose Reels for Hydraulic Pressures up to 2000 PSI. New seal design and kink-free hose entrance. Available in models with nine or 17 foot hose capacities for left or right hand installation. Extra rugged and compact for hydraulic lift truck service. All steel construction. 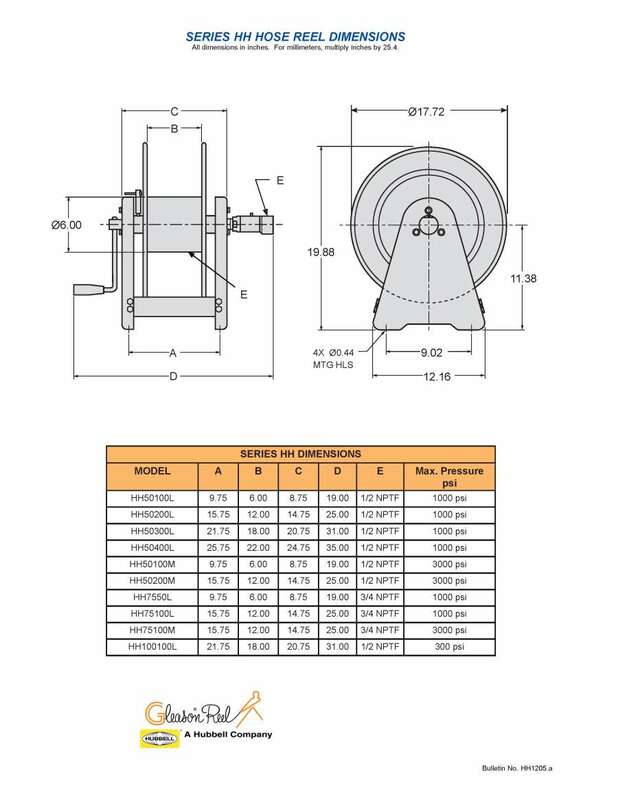 The Gleason U-Reel provides ultimate flexibility... larger diameter and/or wider spools, single or dual spring motors, chain drive where needed. 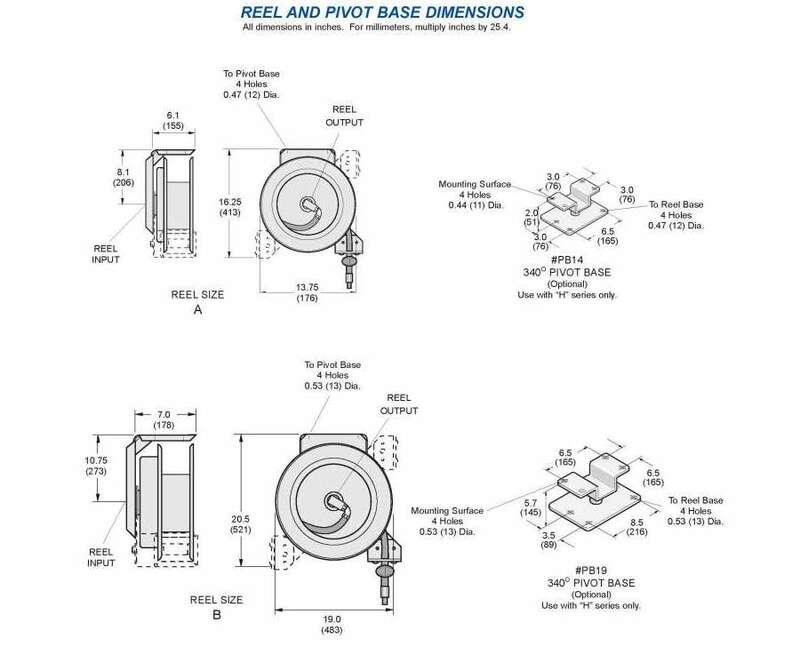 In addition, the modular U-Reel design allows us to provide a custom reel for your application at the cost of an off-the-shelf unit. The rugged U-Reel, featuring a heavy frame with spool supported on dual over-sized bearings, can easily handle air, water or hydraulic hoses up to 1.5"I.D. 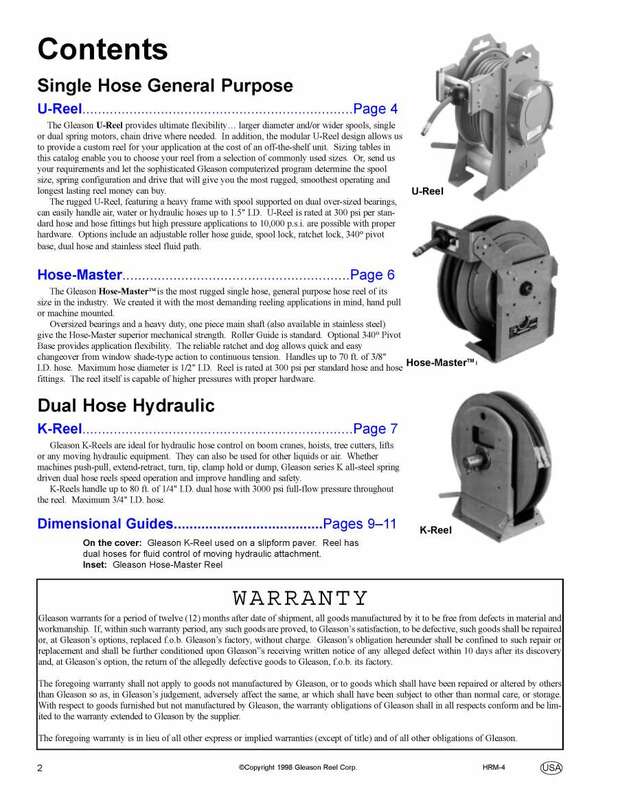 U-Reel is rated at 300 psi per standard hose and hose fittings but high pressure applications to 10,000 psi are possible with proper hardware. 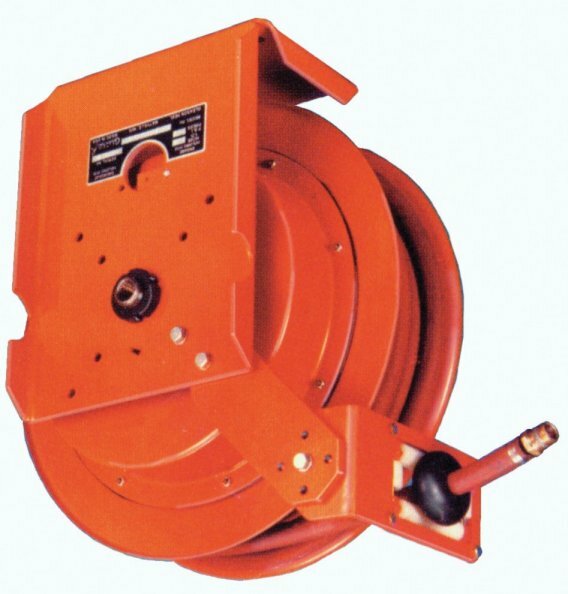 Heavy duty hose reels are designed for supplying air or fluid to machines in applications where the machine supplies the power to pull out the hose and the reel supplies the rewinding power. They are also widely used overhead where the hose is pulled down by hand. 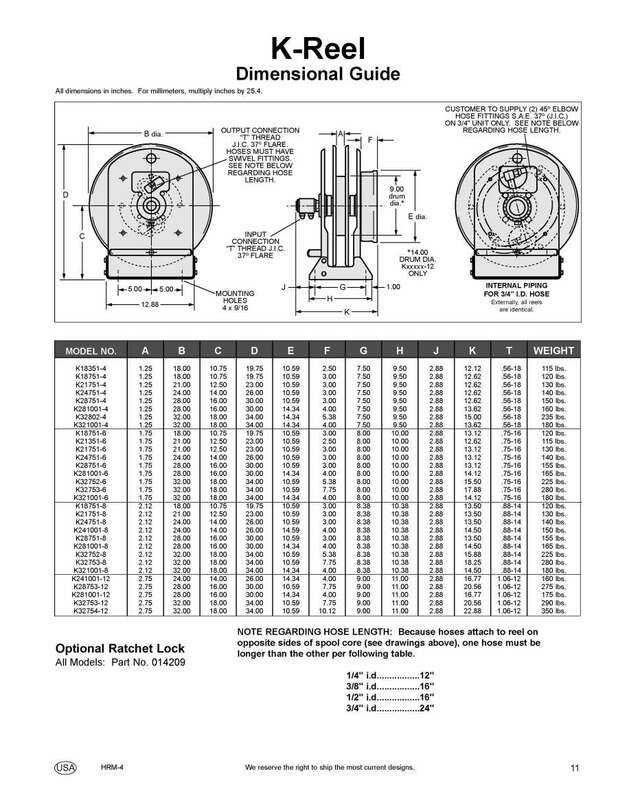 In hand pull applications, a ratchet lock is usually employed to keep the hose extended while in use. E-Z PULLTM REELS are designed to make hose handling safer and smoother and to minimize costly replacement caused by excessive rewind speeds. 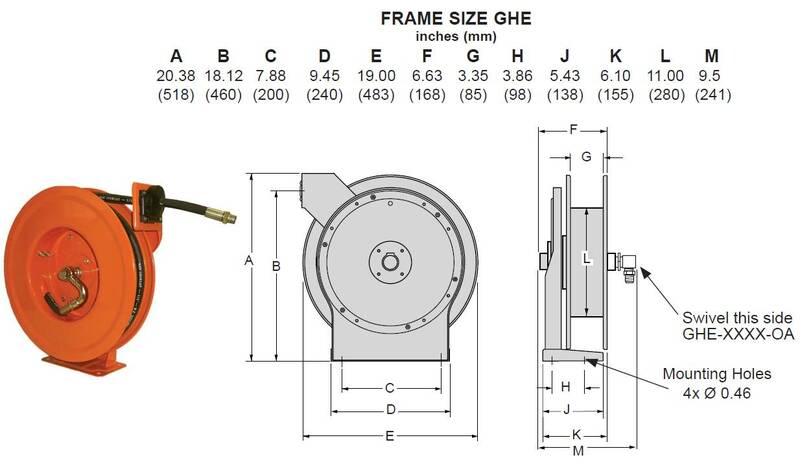 Rewind pull is kept to a minimum resulting in a reel that is gentle to pull out, yet very adequate to rewind the hose. In some situations, the rewind pull provided by E-ZTM PULL reels may require a gentle assist from the operator. E-Z PULLTM reels should be mounted a maximum 3 ft. (0.9m) above the floor so that the hose may be pulled horizontally. 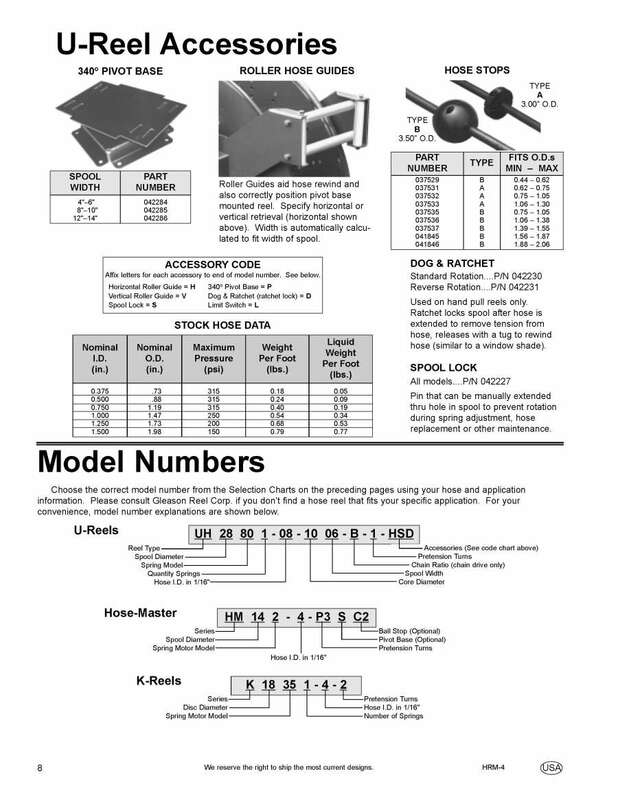 Typical mounting is under a workbench. (40LBS) H 18" L 16" W 8"
(40LBS) H 18.00" L 16.00" W 8.00"
(42LBS) H 22" L 19" W 22"
(49LBS) H 22" L 19" W 27"
(52LBS) H 22" L 19" W 32"
(65LBS) H 22" L 19" W 37"
(43LBS) H 22" L 19" W 21"
(53LBS) H 22" L 19" W 27"
(58LBS) H 22" L 19" W 33"